In our house, the only thing worse than a wasted tomato is a refrigerated one. Now that we’re back from our summer traveling, and a wicked blast of heat has descended on us (just in time for school, of course) we’ve found that tomato season is (still) in full force at our market. There are all kinds of great varieties: red and pink Brandywine, Early Girls, traditional beefsteak, Green Zebra, Jazz, Pineapple, sweet 100s….and even some new organic varieties from the very cool people at Baia Nicolas. I buy a lot of tomatoes. They might be my favorite food and we all eat them every night. At $2-3 a pound, they’re not cheap, but they last much of the week and for the brief few months they’re around, we can’t get enough. 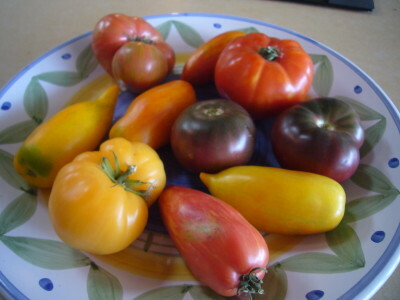 We eat them in Caprese Salad, Bread and Tomato Salad, sliced on white bread for simple Tomato Sandwiches with olive oil, mayonnaise, and a sprinkle of good coarse salt, or sometimes just whole like an apple. However, when you’re making a sandwich or a a few beautiful slices, there’s always the problem of the ends. What to do with them? They don’t look that nice in the presentation, but they also are still really good parts of the tomato. 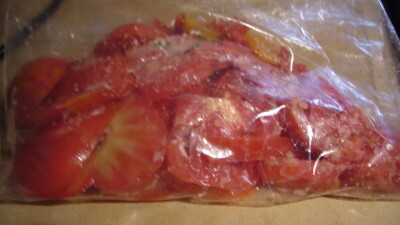 So, for a few years, now, I throw all the unpretty scraps into a ziplock and throw them in the refrigerator because gazpacho is the only way that a fresh tomato should meet refrigeration. It’s enough to make a small portion of “gazpacho” in the blender, and the best part is that the tomatoes are already cold, so very little, if any, additional chilling is necessary. The tomatoes are so good, that I generally have to add little else to them. I throw the tomatoes in the blender and add: some olive oil, a splash of red wine vinegar, a little salt, whatever herbs I feel like (fresh basil, tarragon, chives, parsley..or often none at all), a cucumber slice or two if the spirit moves me, a garlic clove. I know this is not a proper recipe–I’m sure many of you already have more formal, careful, and time consuming recipes–but this works, it’s really fast, and it’s delicious if you have excellent tomatoes. It’s also a recession-friendly way to get all the value out of those expensive tomatoes. 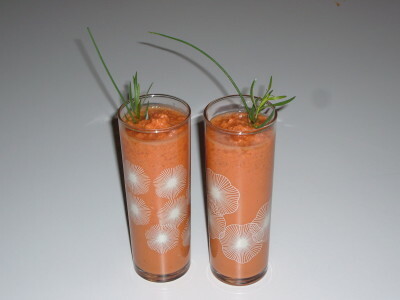 Because there’s usually not a lot of gazpacho, I usually serve it in pretty little aperitif or cocktail glasses, garnished with fresh herbs and a drizzle of oil oil, and more pretty salt. It makes a great first course, or amuse bouche, or small side dish. What a good idea! I love gazpacho and have made many, from complicated recipes to more ad hoc versions. Normally I just eat those odd tomato ends while I’m assembling whatever else I’m making (cook’s tip, I figure) but I’ll start doing this now. Fantastic idea! So easy and economical, I only wish we had tomatoes as good as those in your picture.